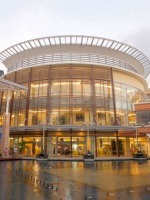 Jungceylon is an international world class shopping, entertainment and leisure destination, set in a tropical resort ambience, at Patong Phuket, and is regarded as Southern Thailand's first lifestyle centre. The name JungCeylon originates from an historical name for the island of Phuket, nearly five hundred years ago, when the island was a prosperous trading and port venue. The full comples covers 200,000 sq metres ( 55 Rai), and it actually has the largest parking area in Patong - catering for 120 coaches and 2,000 cars. This is the ultimate shopping experience with over 300 local and international shops, including Robinson Department Store, Carrefour Hypermarket, Super Sports, Sports World, B25, Power Buy, That's Siam (Thai Arts & Crafts), IT Island and International & Local cuisine restaurants. There are also three hotels, about ten excellent health and beauty and massage outlets, several Banks, and SF Cinema city. Opening Hours: 11.00 hrs to 22.00 hrs Everyday! Don't forget to pick up a Jungceylon Tourist Privilege Card for discounts - available at the Information Desk. Right off on Sai 2 Road, this zone is decorated in a tropical resort style. Inside you will find international fast food eateries, a convenient family food center called "Food Haven", a sport complex-consisting of Sports World and Super Sports, local and international fashion brands and a Thai Arts & Crafts Zone called That's Siam. A showcase of local culture, this zone is a reproduction of Sino-Portuguese style shop house buildings, housing many unique restaurants with excellent fare, bars, lounges, and exciting hangout and entertainment hotspots. Delight your taste buds with a selection from all kinds of food from top ranked restaurants and international cuisines. Walk off your extra calories at a newly opened Fashion Outlet, bringing you great international brands at great bargain prices. Continue to shop till you drop at the Robinson Department Store, Thailand's leading department store carrying all famous brands you know of today. Internationally well known Carrefour Hypermarket will satisfy all your needs from groceries to all your daily essentials. Up for some fun? Then come and visit the SF Cinema City to watch the latest blockbuster hits at this world class movie theater. Then come and hit a strike at the SF Strike Bowl or sing up a tune-karaoke style! After a long day, kick back, relax and pamper yourself at many beauties and spas we offer. You can even walk round to the 5-star-hotel "Millennium Resort Patong Phuket" and check in one of its magnificent rooms and being comfort with premium facilities. This is an outdoor section with a huge lake and plenty of shade. The main focal point is a life-sized reproduction of a 20 meter Chinese Junk Boat equipped with a hydraulic catwalk for all sorts of events and shows. The Water Screen show features multi-media movies projected onto a high-tech water screen incorporated with light, sound and live performance. Note that if you view the water screen show from the relaxing atmosphere of an adjacent open-air bar, you will unfortunately not appreciate the full effect of the images displayed on the water fountains and sprays. The images ideally need to viewed face-on, and not from too much of an angle.